TR: Tell us a little about yourself. Do you have a significant other? Kids? Dogs? Boat? Val: I have been with my partner Susan Rockrise for the last 20 years. She has helped me and my business immeasurably as marketing is her forte, being Creative Director at Intel. We have no kids, 3 cats and 6 boats. TR: Where do you live? Got any water on your property? Val: We have three properties; an apartment in San Francisco and houses in Tomales and Fall River. We bought an old farm house on Fall River as an investment in our retirement futures. The place is a historic two-story structure with a comanding view of the valley. Fall River is the largest spring creek in the US by volumne. It’s one of the most beautiful valleys in the country. TR: How long have you been shooting photos of fly fishing? Val: I have been shooting fly fishing and lifestyle imagery since I graduated from art school and came west from PA and Ohio looking for something special. That was in 1971, the same year Jimmie Hendrix and Janis Joplin died. I went to Jimi’s funeral in Seattle. That’s a rambling way to say 35 years. TR: I’ll be honest, I’ve looked at your photography since I was a kid — just getting into fishing. I think the very first fly fishing book I owned was a photo book of yours. You’ve definitely transformed who I am to some extent and what I do for a living. Tell me you hear that from other people? Val: People in the business frequently say that I’ve inspired them to some degree. That’s quite a nice compliment and I appreciate it sincerely. However, at time it just makes me feel old. A friend once told me that good fortune comes when opportunity meets preparation and talent. If you stick with your passions long enough something magical always happens. TR: You’re one of the “grandfathers” of fly fishing photography. Can you tell us what it was like back “then,” compared to these days when it seems everyone has a camera and is shooting fishing photos? Val: When I first started shooting fly fishing there were maybe only four or five other guys doing the same thing. We mostly shot black & white and because I had taken Ansel Adams classes and had my own darkroom and could make the blacks black and the whites white, they’d never seen that kind of quality before and they would buy everything. It was absolutely terrific. However, there were fewer magazines in those days. Later new ones came along and there were almost too many. Now we’re going the other way again with magazines and newspapers folding left and right. TR: Digital photography: Good for the industry or bad? Val: The digital revolution has absolutely changed photography forever. Creative imagery has reached new levels. The ease and speed and adaptability of digital cameras can make anyone an artist. The bar has been raised for everyone. I’ve been shooting digital for four years now and I honestly think I’m a better photographer for it. The same is true for most folks I think. Even people who never carried a camera before are now “pro shooters.” It’s so easy. But I do think that 6 years of art school training — studying fine art, Illustration and photography — have given me something unique to bring to the table. TR: Do you remember the first time you thought to yourself “I can make money taking pictures”? Or has that always been the goal from the start? Val: My plan from high school was to become a commercial artist. At first it was Illustration then later photography. I went to Columbus College of Art & Design in Ohio for five years studying to become a professional something. TR: Where have you been published? Val: I have been published in most fishing and many mainstream magazines in the United States and abroad. I have five photography books published, of which I am very proud. They can be viewed and purchased on my web site at ValAtkinson.com. TR: Who are your clients? Val: I try to divide my work between advertising — which pays the most, corporate, and editorial — which pays the least but in other ways is the most rewarding. I think most professional photographers try to compliment their work by achieving some success in all three. I had a wonderful opportunity to work with Frontiers International Travel for 16 years as their staff photographer. It enabled me to go from fishing and photographing locally to traveling the world. For the first several years they sent me to a new location every month. 16 years later I had been to 29 countries shooting for their various brochures. Even to this day I think I can say I arguably have the largest stock library of international fly-fishing images on the planet — over 100,000 images on file as digital or transparency. TR: What’s been your most memorable fishing trip in regards to photography? Val: I’ve really enjoyed fishing and photography in England, Scotland and Ireland. 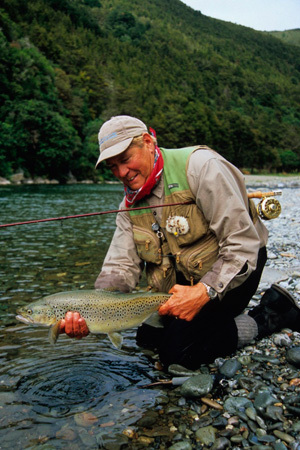 These three countries have what I enjoy most in foreign travel: a variety of fishing, from the sublime chalk streams to the rugged salmon rivers in the highlands to the loughs of Ireland. I enjoy very much the history of these places, the people are wonderful, and the pubs are world-renowned. The scenery is also terrific. What more could one ask for? Having said that I can honestly say there is not a single country I’ve visited that I wouldn’t go back to in a heartbeat. TR: What about the sketchiest situation? VAL: One of the most challenging was when Susan and I went to a lodge in Costa Rica on an important shoot for Frontiers and it rained 22 inches in three days and the river we were supposed to fish was 1ten feet over the banks and the color of coffee. How were we going to make something work? Employers do not want to hear excuses. We sat around for three or four days playing cards and being depressed. But on the very last day a guide had come back in saying there were large tarpon in the estuary where the dirty river water met the clear ocean. They were feeding on the edge of the muddy water. We went down and to this day I’ve never seen faster or more exciting action. There were 100-pound tarpon everywhere. I was able to get some fantastic shots to pull off what might have been a disaster — and my last — trip for Frontiers. But I could write a book about the challenges I’ve faced in the line of duty. TR: Do you have a single favorite photograph that you’ve taken? Val: My “jumping mullet” has proven to be my most famous image. It was taken in the Seychelles as a school of hundreds of mullet spooked by a shark or barracuda came porpoising in and out of the water right at me. I had my camera around my neck — where it usually resides — and time only to point and shoot two frames. The mullet came right around and past me in about three seconds flat. The amazing thing is that images were sharp and well-composed. TR: On a typical shoot what do you bring along? I’m not talking about everything you own, but what’s in the bag? Val: Well I’m a true believer in less being more, so I travel pretty light. Although I own heaps of gear I typically bring two Nikon D700s, wide-angles to telephotos and lots of chips, which I download every night to a portable laptop and backup hard drive. I clean my gear frequently to make sure things are working and try to keep as much dust, salt and moisture off as possible. TR: What single tip would you give a person looking to hone their skills as a fishing photographer? Val: Just keep shooting with truth, adventure and passion. The magic will come. As Luke (Star Wars) said, “Trust the Force”.